The Seoul International Jockey Challenge 2012 is the highlight of the weekend’s action on the peninsula as six visiting riders take on six of the capital’s best in the annual four-race challenge. 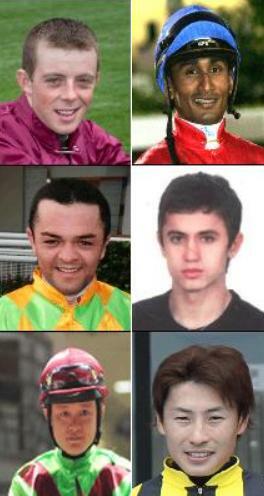 The jockeys will compete against each other in four races, two on Saturday and two on Sunday, culminating in the YTN Cup Stakes. In addition to the team prize, the leading jockey overall will take home an additional $20,000 prize. Neither the United States nor Australia have sent riders this year so instead, the visitors hail from countries that the Korea Racing Authority has been forging close links with in recent years. Ireland and South Africa send young up and comers, while Macau, Turkey, Singapore and Japan’s entrants are all more experienced. Ben Curtis (Ireland) – 1840 rides / 122 wins – Former champion Irish apprentice, the 23-year-old is an American citizen and has also ridden in the USA, and UK. Manoel Nunes D’Silva (Brazil) – 7831/1269 – Representing Macau in the challenge, the Brazilian learned his trade in Sao Paolo but has been riding in Asia for almost a decade. He’s won numerous Stakes races in Macau and has also ridden in Hong Kong and Dubai. Soo Khoon Beng (Singapore) – 4139/519 – The 2005 Singapore Champion jockey spent a short but uneventful time riding at Busan in 2008. He’s won a number of Stakes races in his homeland. Karis Teetan (South African) – 3581/445 – Born in Mauritius, he rides mainly in Cape Town and Port Elizabeth. He won the Cape Derby on Jackson earlier this year. Ozcan Yildirim (Turkey) – 7481/744 – He has 28 Graded Stakes victories in Turkey and 72 winners in the past year. Hayato Yoshida (Japan) – 5781/443) – Ninth in the JRA standings this year with 41 winners, Yoshida is Japan’s only representative this year. Riding for the Koreans are: Moon Se Young, Cho Kyoung Ho, Park Tae Jong, Jo In Kwen, Ham Wan Sik and Kim Hae Sun. Scoring: 1st: 20 points, 2nd: 10 points, 3rd: 6 points, 4th: 4 points, 5th: 3 points, 6th: 2 points, 7th-: 1 point.